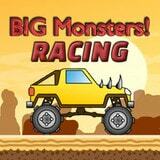 Go to travel by the lorry in Big Monsters Racing. You are waited by fascinating levels which not always will manage to be passed from the first. However having earned enough of coins it is possible to buy new авто.